Cinnamon Rolls Recipe - Last year we published Cinnamon Roll Apple Pie Recipe and today we are going to share simple cinnamon rolls recipe. 1. Generously butter two disposable foil pie/cake pans. 2. In a large bowl, whisk together warm milk, melted butter, and granulated sugar. The mixture should be just warm, registering between 100-110˚F. If it is hotter, allow to cool slightly. 3. Sprinkle the yeast evenly over the warm mixture and let set for 1 minute. 9. Knead the dough lightly, adding additional flour as necessary, until the dough just loses its stickiness and does not stick to the surface. 10. Roll the dough out into a large rectangle, about ½-inch thick. Fix corners to make sure they are sharp and even. 11. Spread the softened butter evenly over the dough. 12. Sprinkle evenly with brown sugar and a generous sprinkling of cinnamon. Press the mixture into the butter. 13. Roll up the dough, forming a log, and pinch the seam closed. Place seam-side down. Trim off any unevenness on either end. 14. Cut the log in half, then divide each half into 7 evenly sized pieces (about 1½ inches thick each). 15. Place 7 cinnamon rolls in each cake pan, one in the center, six around the sides. Cover with plastic wrap and place in a warm place to rise for 30 minutes. 16. Remove plastic wrap. 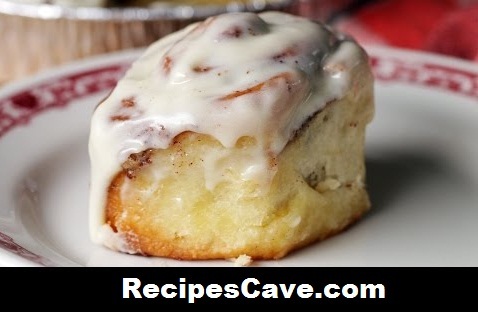 Bake the cinnamon rolls in a preheated oven for 25-30 minutes, until golden brown. 17. While the cinnamon rolls are baking, prepare the frosting. In a medium-size mixing bowl, whisk together cream cheese, butter, vanilla, whole milk, and powdered sugar, until smooth. 18. Remove the cinnamon buns from the oven. While still warm, drizzle evenly with frosting.